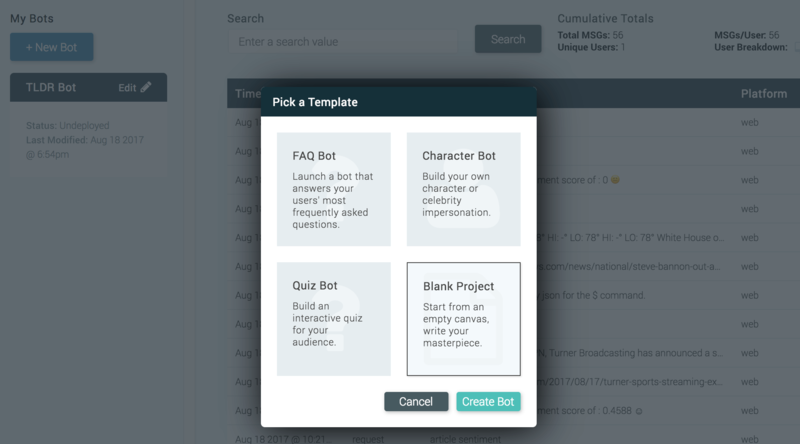 Recently Jon Peck, who is a Software Engineer and Developer Evangelist at Algorithmia, wrote a fun post on how to get an emotionally aware chatbot up and running in about 15 minutes. In this hands-on micro workshop, Jon will show you how to create a chatbot using Dexter, a company that makes building chatbots easy and accessible. Then he'll show you how to make the chatbot emotionally aware using Algorithmia. Our open marketplace that hosts over 4,000 algorithms and microservices that are all available via a scalable API endpoint. Jon will also go through some use cases covering why you would need a chatbot, especially one enabled with machine learning and provide some examples of other machine learning algorithms that work well in chatbots, but aren't covered in the demo. Please join us for a fun evening of food and drinks provided by Algorithmia and learn how to build an emotionally intelligent chatbot! For more information or to RSVP check out the Seattle Building Intelligent Applications Meetup.